A little more than one year ago, we introduced to you a handset called the BlackBerry Z5. This "all-touch"model was supposed to be the companion piece to the QWERTY equipped BlackBerry Q5. But last December, BlackBerry cancelled the phone, which was code named the Cafe. The Z5 was axed by the manufacturer after the company signed a five year deal with Foxconn that covered the design and production of entry-level models for the emerging markets. The first phone to roll off the Foxconn assembly line as part of the arrangement, the BlackBerry Z3, was recently launched in Indonesia with a release in India coming soon. 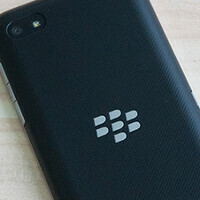 What has us looking at the BlackBerry Z5 after its cancellation, is a fresh series of photographs featuring the device. As you might expect, the specs of the device would not have blown you away. The phone was to be equipped with a 4.5 inch display with a 300ppi pixel density. Under the hood you would have found a dual-core 1GHz Qualcomm Snapdragon MSM8960 S4 processor with 1.5GB of RAM inside. 8GB of native storage was to be on board. The back and front-facing cameras were to weigh in at 5MP and 1.3MP respectively, and the device was going to be powered by a 2100mAh battery. It's all water under the bridge anyway, since the device will never see the light of day. Still it is interesting to see what might have been. Keep in mind that this handset was designed during the Thorsten Heins era. Why buy this phone if you want android? You won't got any factory support at all, and might have a glitch version of android for unsupported device. Moto G would be A LOT better phone than this phone. 1. If you go to CM download link or any custom rom you will notice that popular phone got BETTER support. because this is bb and WILL NOT BE POPULAR, the support (quality) of the rom will be poor. 2. because this phone originally is NOT android, the support might be poor. some hardware support might be lost. 5 years ago bb still drunk. the dynamic duo of bb still think they were the king of the hill.